November 5, 2013 By This post may contain affiliate links. 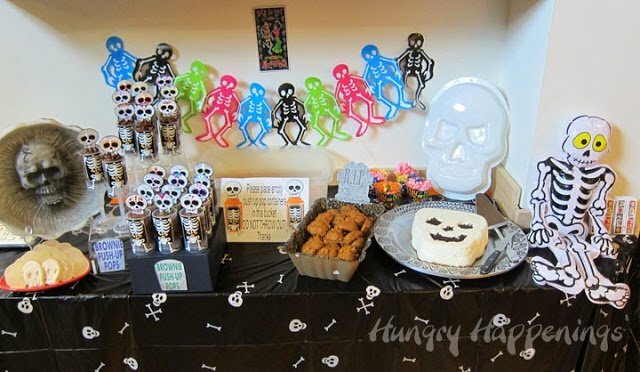 We hosted a Day of the Dead party and I want to share some great party planning ideas with you. 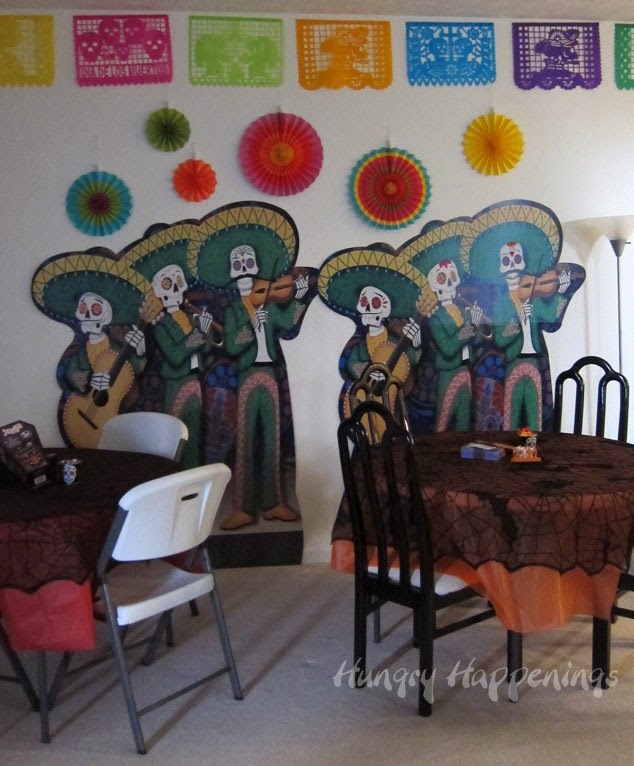 I have great tips for turning your house into the most spectacular venue to celebrate Dia de Los Muertos. Halloween is over, and I know you’ve all moved on, so bear with me for just one more post. The night or our party was a whirlwind of excitement. Party guests once again were blow away with all the work we put into the Day of the Dead decorations and food. Their favorite area, as usual, was the dessert table. 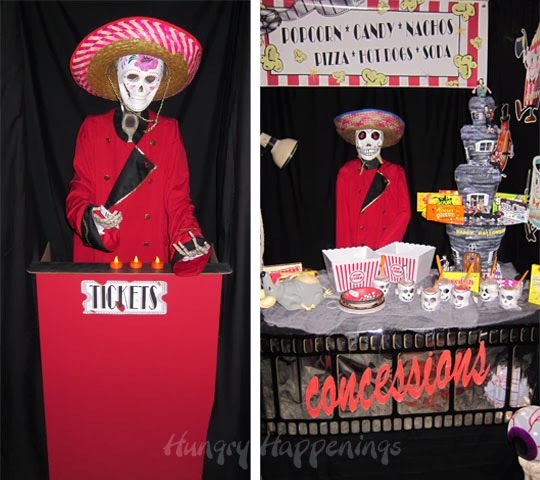 My husband built and I decorated a traditional Dia de los Muertos alter which was home to our sweet treats. 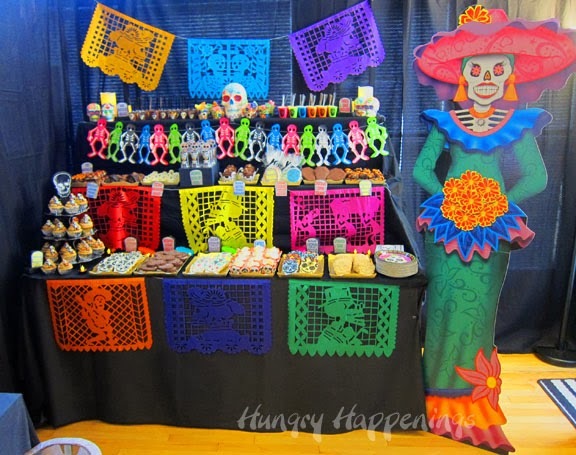 Our guests gobbled up sugar skull decorated cookies and brownies, s’mores cupcakes, snickerdoodle cupcakes, chocolate peanut butter cupcakes, coconut macaroon ghosts, sugar skull chocolates, cheesecake and chocolate mousse cups, white chocolate popcorn and three different types of Halloween magic bars. That’s not all. They also enjoyed homemade gumdrop skulls, chocolate brownie push up pops, pumpkin spice cookies and a no-bake cheesecake skull. 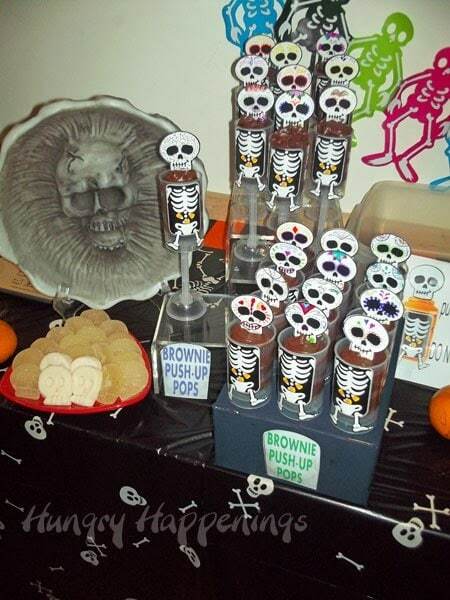 We did our best to pump up the Mexican Day of the Dead theme using sugar skull decorations everywhere including our push-up pops. We added Wilton’s Treat Pop Skeleton Decorating Kits to the containers, but we didn’t leave them plain, we colored on designs to make each skull unique. I loved how these looked, and they were the big hit with the kids. Even with 24 guests enjoying these desserts, I managed to save 21 of the push-up pop containers from ending up in the trash. In the end it didn’t really matter, though, because we had to use Goo Gone to remove the labels, which made the containers smell awful. In the end they all ended up in the trash. All of my guests commented on how bright and colorful our decorations were this year. 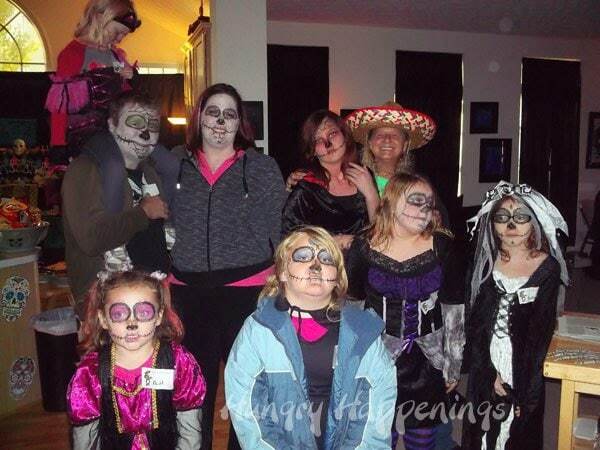 It was a big change from the zombie party we hosted last year. We decorated the living room with a Day of the Dead Mariachi band and even had Mariachi music playing which added to the festive mood. 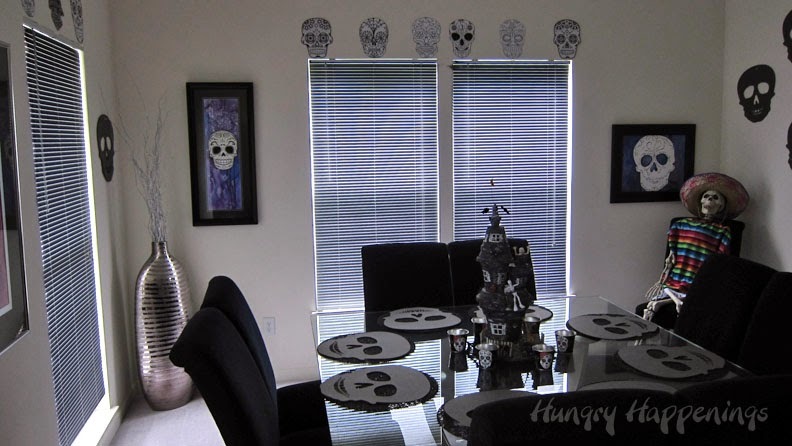 Traditional Papel Picado, intricately cut tissue paper featuring humorous images of skeletons and skulls, hung in various rooms in the house and really added a nice punch of color to my black and white living room. 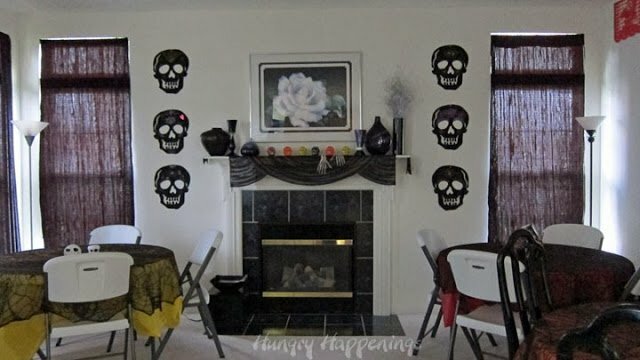 My mom, turned felt skulls from the dollar store into sugar skulls which we hung all over the walls. My living room, with the addition of the skulls, black curtains, and spider web tablecloths, looked rather elegant! 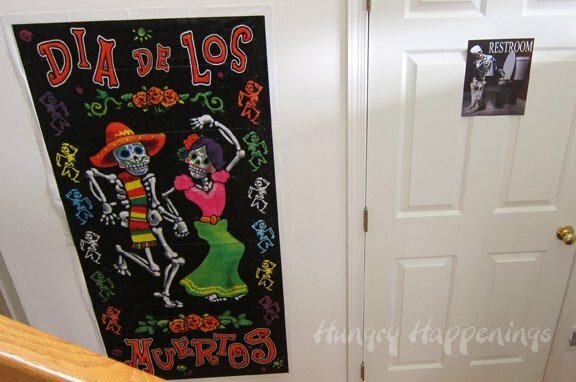 In the kitchen, we hung more felt sugar skulls along with some papel picado and added brightly colored skeletons. They added a touch of whimsy to the boring crock pot lined counter tops. 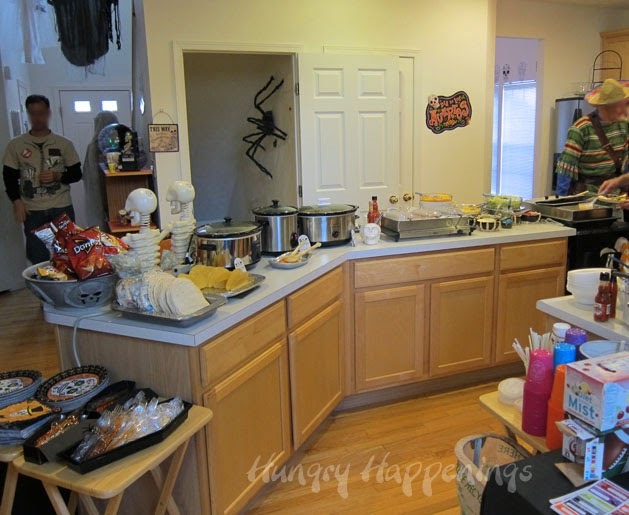 I usually decorate my island to match the theme of the party, which has to be done the night before the party, after we finish making all the food. 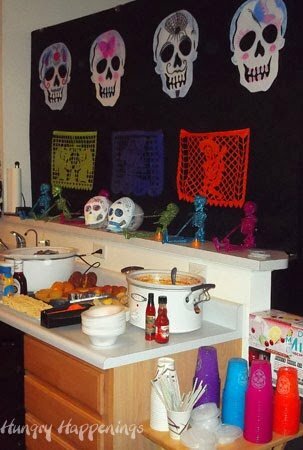 It was nice to keep it simple this year and the taco bar was a huge hit. At the end of the night, there wasn’t much food or dessert left. If all 105 guests who were expected, actually showed, I’m sure all the food would have been gone. We had 19 no shows this year, due to illness in the families. I have to admit on a year when it was too cold to open our garage door, to allow the party to flow outside, it was good to only have 86 people in attendance. 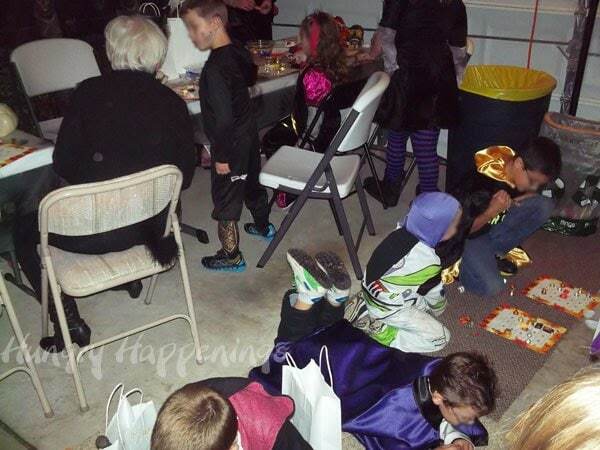 You can see how crowded it was in the garage where the kids were playing games. We even had kids playing bingo on carpets on the garage floor. They didn’t seem to mind. I blurred the faces of our guests, as I wont publish a picture of someone without permission and didn’t have time to ask everyone. Every inch of the house was decorated including the entry hallway. I have a shelf which I enjoy decorating every year, and I got to use all of my skulls this year. So many of our decorations stayed in bins this year, but we really wanted to use our large dummies, so my mom painted sugar skull masks for them to wear so they would fit into the theme. 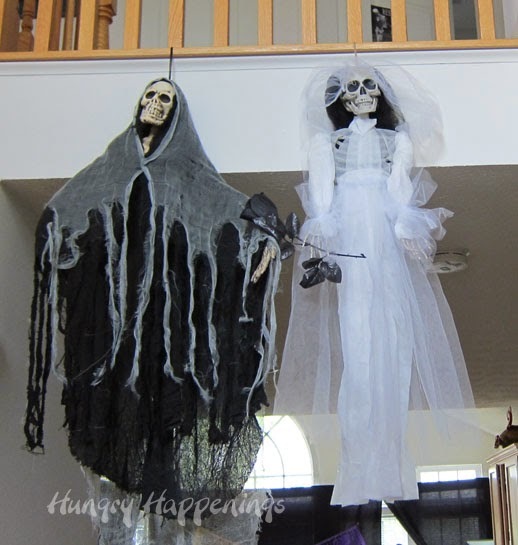 Our bride and groom skeletons hung from the stairs and greeted guests upon entry to the house. I couldn’t find any Day of the Dead decorations locally, so I had to order everything on-line including this wall hanging. Our dining room was simply decorated this year with lots of felt and paper skulls. We need every bit of seating for our guests, but I did prop up one dead guy in the corner. 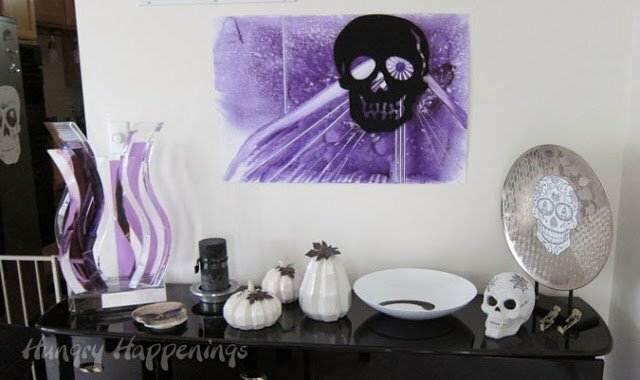 I kept the other decorations in the room simple, adding skulls and even a few pretty white pumpkin to my every day decor. Our Catacomb Cinemas in the basement was much the same as last year, just with a few Day of the Dead twists like masks and sombreros on our movie theater workers. We showed Paranorman on the big screen and had a big crowd watching the movie, snacking on popcorn and candy from the concession stand. Many of the props in the basement were just decorated with hats and masks to fit the theme. Yes, we have a Christmas tree in our basement decorated with skulls. 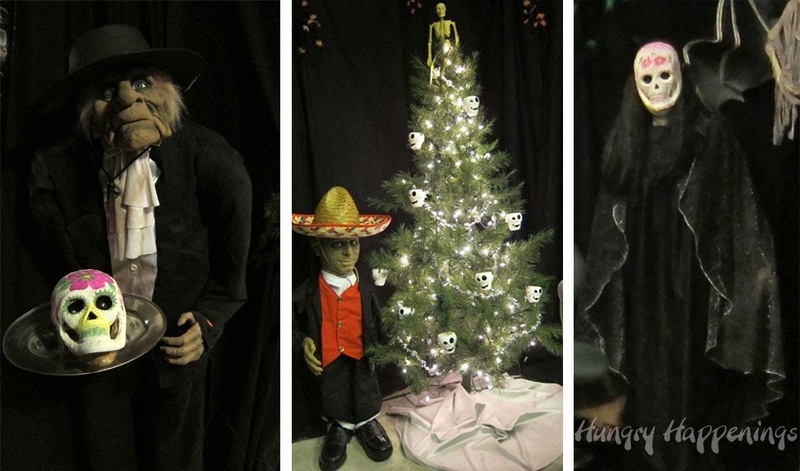 I’m running out of room to store things, so we put the tree out one year, and I loved it so much, that it has become part of the Halloween decor. 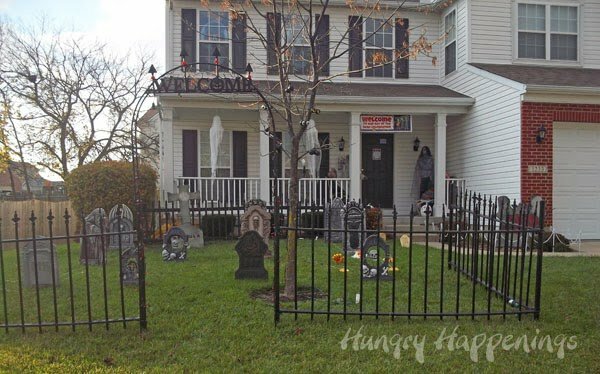 The front of our house was once again decorated with the graveyard. As our guests walked up to the door, they were greeted by this lovely dead couple. The woman shown here was created by my friend Vickie. 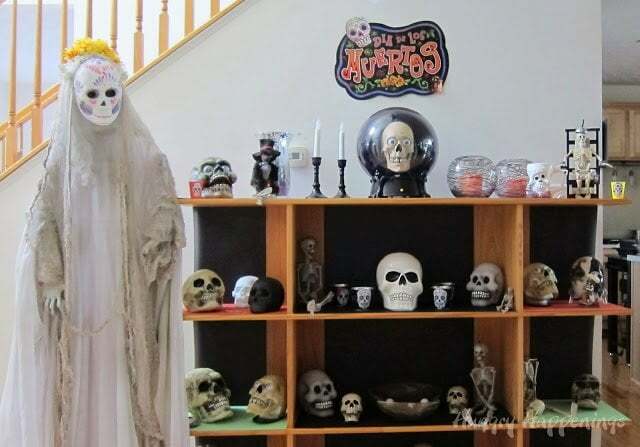 She hosts Halloween parties too and makes all her own props which are amazing. It’s so nice to be able to borrow a few of her decorations each year for our party. 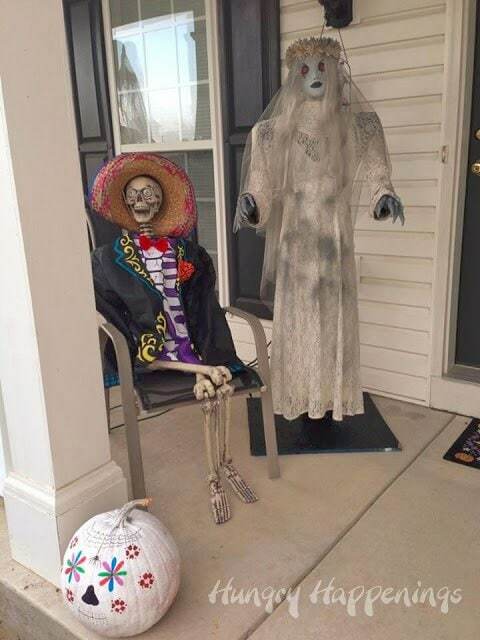 There was another dead couple and a few sugar skull pumpkins on the porch too. 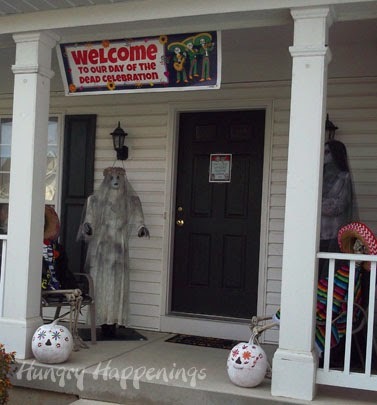 We had a banner printed to welcome our guests to our Day of the Dead Celebration. Speaking of guests, some of them created really clever costumes for the party. 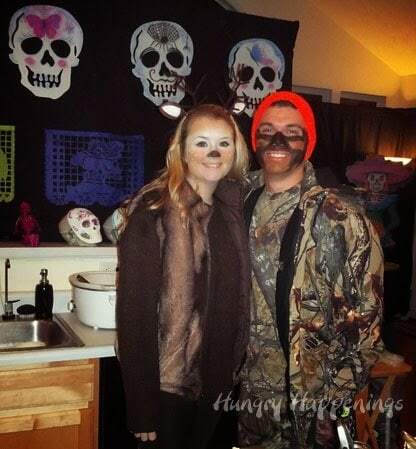 My niece, Amanda, and her boyfriend, TJ, looked amazing as a hunter and deer. Amanda sure made a gorgeous deer. 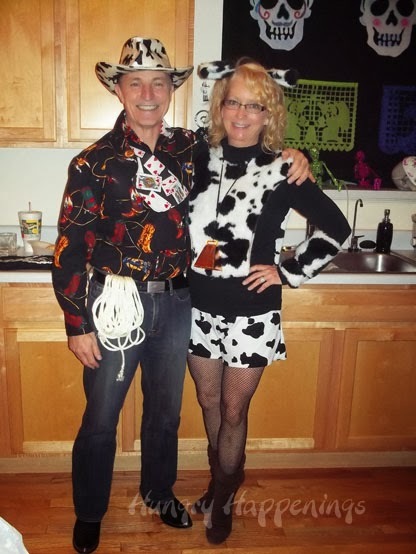 My friend Meg is very handy with the sewing machine and she made her cow costume and her husband, Pete’s, cowboy shirt. The made such a cute pair at the party. 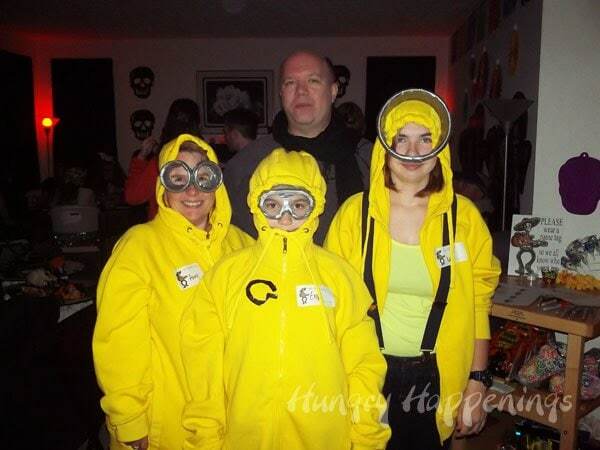 The Despicable Me family costume was my favorite group of the night. I love seeing homemade costumes come to life and Amy, Elizabeth, and Emma were the perfect Minions along with Brian as Gru. I was so excited to see this family who really got into the spirit of the party theme. Jessie (not pictured) painted every one of these faces and did an amazing job. Thanks to Hannah, Shawn, Brandy, Cora, Vickie, Faith, Devon, Emma, and Sydney for looking so dead! 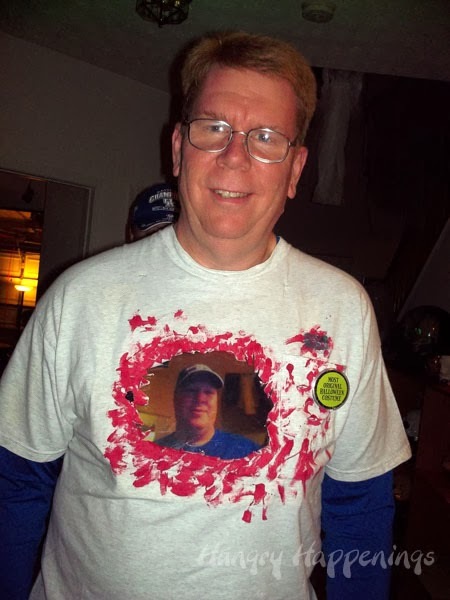 At first glance, you might think this man is wearing a picture of another man on his bloody chest. Not so. My brother, Kevin, is wearing two i-pads, one on his front, and one on his back. When you look at him, you are seeing my brother in-law, Jeff, who is standing behind him. As Kevin walked around, you would see right through him. His costume was voted the best of the night. Finding a costume to wear each year is the only part of Halloween I hate. Shopping for clothes, in general, is the bane of my existence Being 5’11” tall and large boned, makes it impossible to find a store bought costume. Recently, I bought a new dress to wear on a press trip I’ll be going on in December, and thought it made a good Day of the Dead costume, as well. 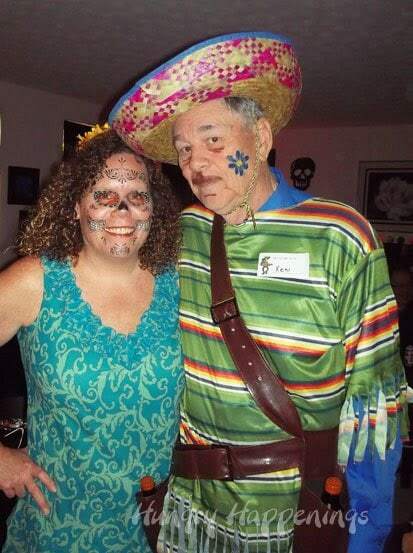 I put marigolds in my hair and a sugar skull tattoo on my face to complete the outfit. I got a lot of compliments on my costume, which was nice. Here I am with my dad. 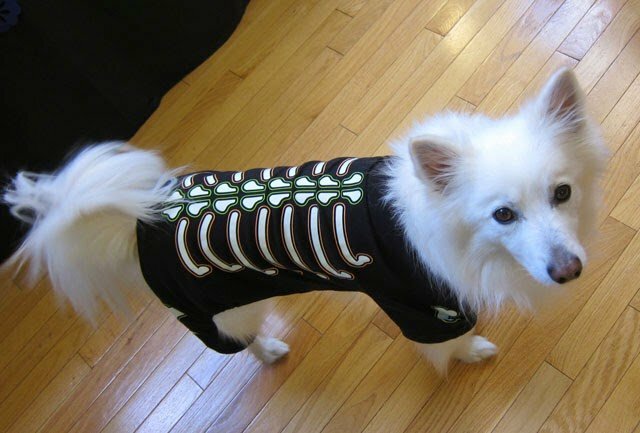 I found the costume he is wearing for my husband, but he didn’t want to wear it. I was happy it went to good use. My dad looked great. My husband ended up in a skeleton t-shirt and a sugar skull mask. He was comfortable and happy. The absolute cutest guest at the party had to have been our dog, Truffle. She was the hit of the night in her glow in the dark skeleton costume. Isn’t she sweet? Well, that’s it. Halloween is over until next year. Our party guests left and the house felt so empty. We truly enjoyed hosting our guests for this party, but I am dead tired. I cleaned all day Sunday and took Monday completely off. I spent the day in bed watching a marathon of The Good Witch on the Hallmark Channel. Today, I’m back to work and will be back next week with some new recipes for fall. Before I go, I’d like to thank Kim, Louise, Darcy, Cheri, Vickie, Odesa, Jessie, Brandy, Colleen and Julliane for help in decorating and cooking for the party. 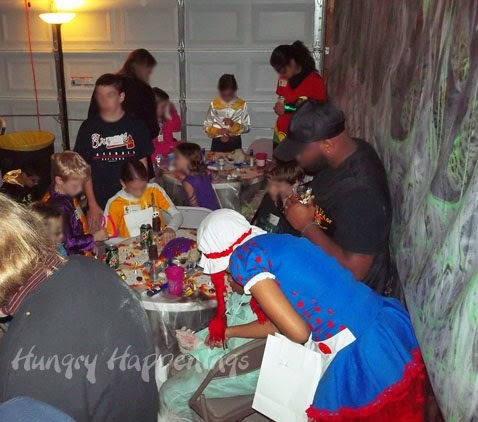 Thanks to all the parents who pitched in during the party to help with the kid’s activities too! Hi Beth, what a wonderful party! No wonder you were exhausted, you went to great lengths in order to make every perfect. LOVED every minute of the party!!! Your decorations looked amazing! 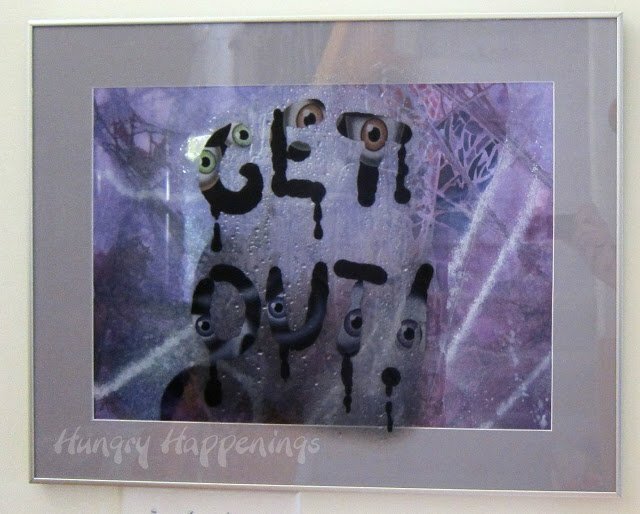 I especially liked the picture you had on the bathroom door. It made me chuckle. Wow! What a super party! Loved all your decorations. 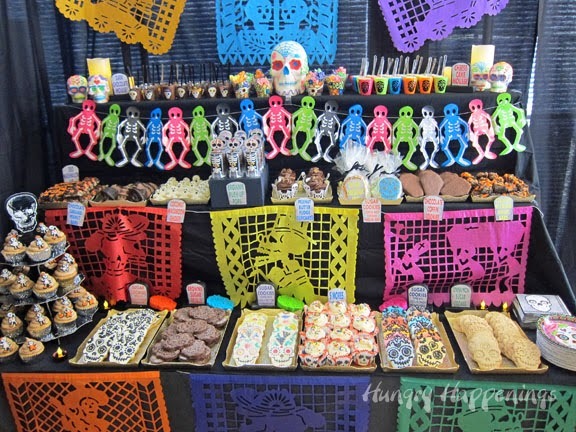 I'm having a Day of the Dead Party next year and so this year I went to a Day of the Dead celebration and was thrilled I found some items to purchase because like you, I have not been able to find any! Where on line did you order your things from? I love the large items you found. Hi Joanne, it was a fun party theme, that's for sure. I got most of my decorations at Shindigz and Oriental Trading. The big things all came from Shindigz. I try not to buy things I can only use once, but really wanted some very specific items for our party, and the marriachi band and the woman standees really added to the decor. Hope have have a great party, next year!